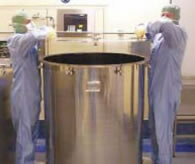 These tanks are used for the production of a Respiratory Solution and have a solid one-piece lid, which is manually removed and replaced before and after use in the manufacturing process. The 25.5 kg weight of the lid makes it a two-person lift. To remove the lid the operators have to lift it to or above shoulder height which puts strain on the wrists, shoulders and back. The operators then carry the lid to the storage area at the side of the tank, perform a horizontal 180º turn of the lid to ensure its handles are facing outwards, and then lower it into its storage position. The wrists and shoulders are statically loaded throughout the lifting / lowering procedure and lower back pain has been reported while lowering/lifting the lid into the storage position. Use an alternative tank. In the Liquid Inhalations area 750kg nominal capacity tanks are used for the manufacture and filling of products. These tanks have a hinged manway cover to allow access into the permanently fixed lid and it was decided to move Respiratory Solution manufacture to these tanks. Using the other tanks has removed the manual handling risk at no extra cost. Stopping using the tank with the removable lid also eliminates the risk of injury to operators due to the lid being dropped during removal / replacement or it being dropped onto hands while carrying out the cleaning process. The culture changes to the way vessels are used allow a more flexible use of tanks and increased storage space. Using only one type of tank will simplify other handling issues and other procedures such as tank cleaning.